This block is called Chicken Foot and was designed by Lori Holt of Bee in My Bonnet. 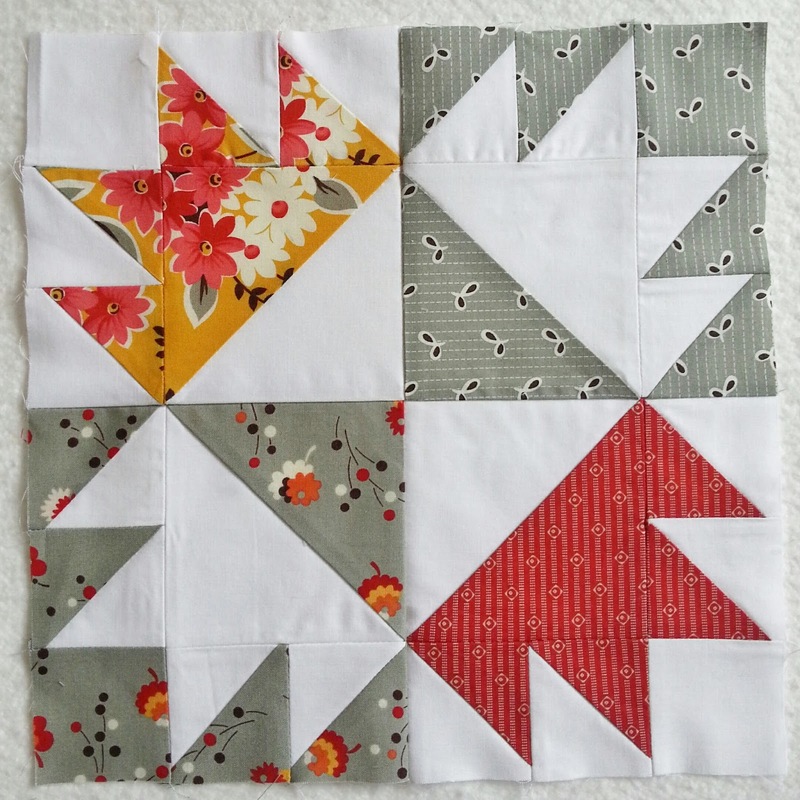 Her original tutorial makes a teeny 6.5" block, so more resizing was in order for me. For a 12.5" block you will need to change the measurements on her tutorial. Each 1 1/2" square will need to be a 2 1/2" square. If you cut and sew accurately, the pieces will work out perfectly, with no trimming! Yay!! I did go ahead and used Lori's Easy HST method for making my blocks. To be honest, since I was making 6 bee blocks, it was a super easy method, but I was a little discouraged with the loads of regular HST's I ended up with after trimming. So, I was a psycho and stitched up all 144 little cast-offs cuz I couldn't bear to throw them out. Hopefully they will turn into something awesome in the future. 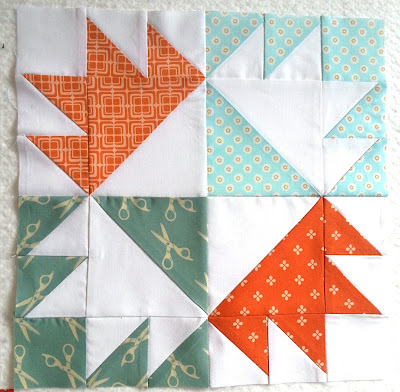 Maybe if I was only making one block I wouldn't have cared so much about throwing away the little triangles. It is an awesome block! The Flea Market Fancy one is for my pinterest sampler and the other one is for my aqua and orange quilt. I'll post my bee blocks in a couple days so you can see the other variations I made. I always save all those little castoff HSTs. I cannot bring myself to throw them away either. I feel ya.